Archaeologists have long wondered how the hats atop Easter Island’s iconic statues were put in place. Easter hats are nice. Easter Island hats, however, are a pain. Carved from sharp volcanic rock and more than 700 years old, the stone formations can weigh upwards of 13 tons. 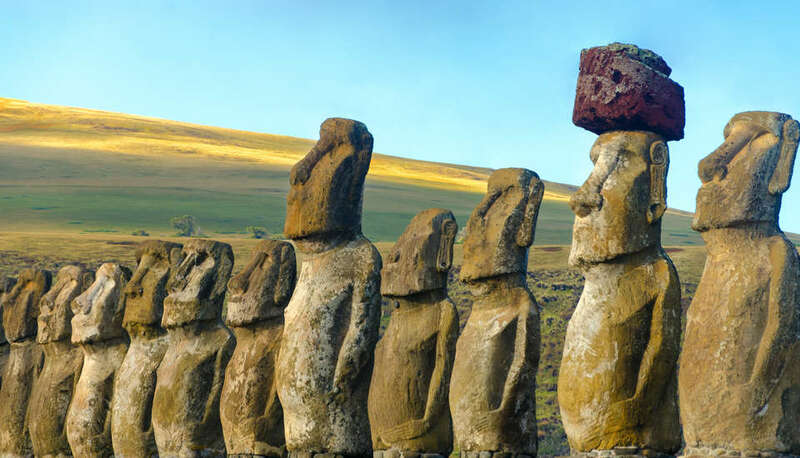 Archaeologists have long wondered how these stone hats, which sit atop the heads of the famous Easter Island statues, were put into place with 13th-century technology. Wonder no more. Using old-school archaeological techniques and cutting-edge 3D computer modeling, researchers have finally solved the mystery of the Easter Island hats. The short answer: Ropes and ramps. But the long answer has some interesting specifics. Rapa Nui, or Easter Island, rises from the waves about 2,000 miles from Chile. The island's famous statues have been studied by various teams of archaeologists and geologists since the 18th century. Previous studies determined that the statues are made of from one quarry on the island, while the hats come from a different quarry, seven miles away on the other side of the island. We know, more or less, how the statues were carved and transported. But those hats have been a matter of contention for several decades. Archaeological evidence shows that the hat structures were carved independently from the statues and somehow dropped into place atop the famous stone sentinels. Previous theories suggested that the statues and the hats were fixed together before they were lifted in place, but later studies of other abandoned statues concluded this was not the case. Complicating the mystery, several unattached hats left around the island are much larger than those placed on statues. Using 3D modeling and hands-on analysis of the site materials, the new study concludes that the hat-donning technique was a multi-stage process. 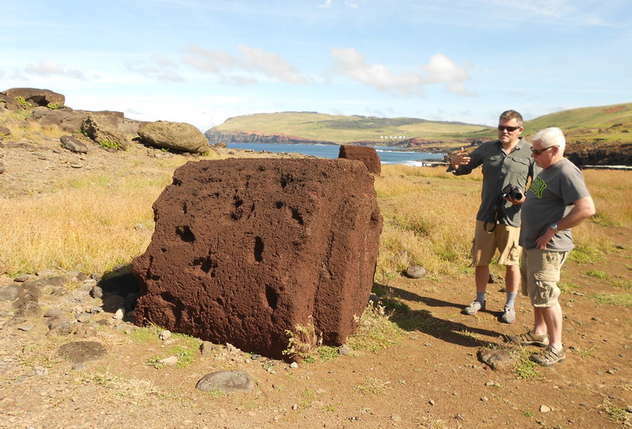 "The best explanation for the transport of the pukao [hats] from the quarry is by rolling the raw material to the location of the moai [statues]," Carl P. Lipo, professor of anthropology at Binghamton University, said in a statement. "Once at the moai, the pukao were rolled up large ramps to the top of a standing statue using a parbuckling technique." Parbuckling is an ancient and efficient technique for rolling cylindrical objects. The center of a long rope is fixed to the top of a ramp and the two trailing ends are wrapped around the cylinder to be moved. Workers atop the ramp then pull on the ropes to slowly roll the cylinder up. The Easter Island technique likely involved a couple of extra steps, according to the research team. Once on top of the ramp, which was built adjacent to the statue, the hat was slowly rotated and tipped into place using wooden levers. The hat was also most likely modified before, during, and after the tipping process. That's the proposed theory, anyway, as published in the latest issue of the Journal of Archaeological Science. "Lots of people have come up with ideas, but we are the first to come up with an idea that uses archaeological evidence," said Sean W. Hixon, Penn State graduate student in anthropology, in supplementary materials issued with the new research. The study was supported in part by the National Science Foundation. The mystery of the Easter Island hats has been solved. Keep this one in your pocket for a breezy anecdote at your next cocktail party.